The brie and crab bake appetizer. Admit it: whenever Robert Irvine chews someone out for not using enough seasoning on Restaurant: Impossible, you laugh. You think to yourself it’s not a big deal and there is no way it can affect the food that badly. Now, store that in the back of your mind for a few minutes while I introduce our next restaurant. 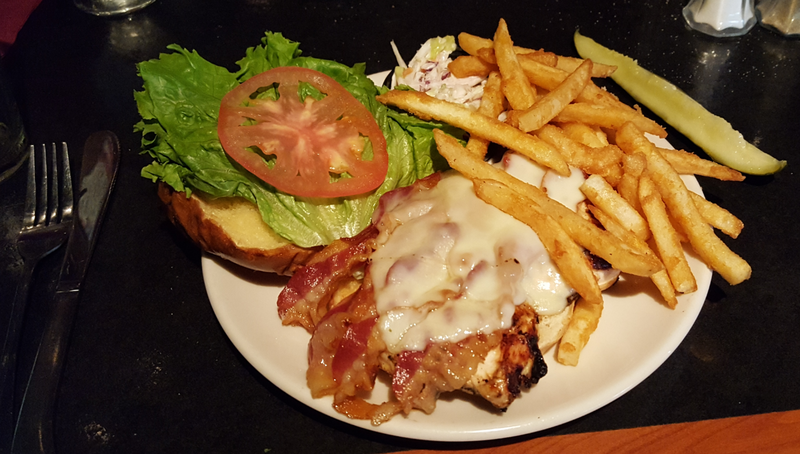 The Fireside Tavern is located in a building which used to be the Historic Strasburg Inn. I haven’t been to the place since I was a small child and even at that I do not remember what it looked like inside for the life of me. It has been a handful of different restaurants since, but Fireside seems to have stuck around for the last couple of years. The menu has the usual pub grub, and the atmosphere inside the historic inn is wonderful. Drink prices were also decent, with bottles of local craft beer (Lancaster Brewing Company) going for $3.50. 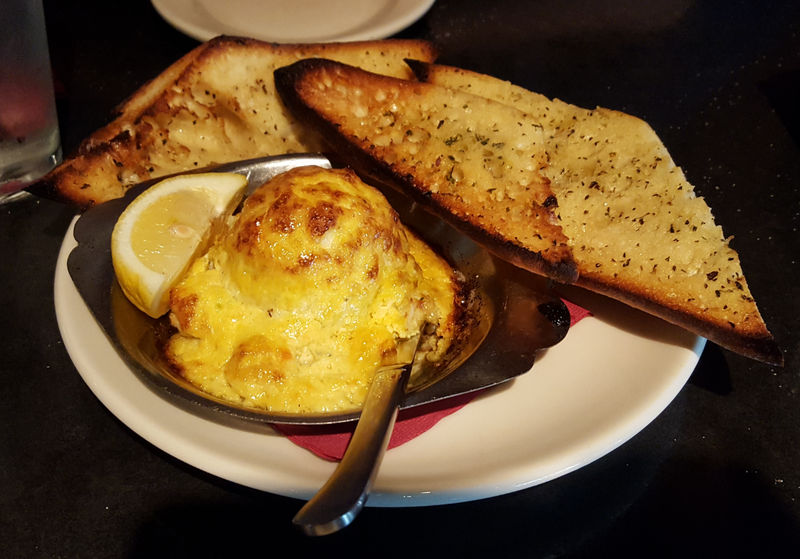 We started off with the brie and crab bake as an appetizer. The crab was lump and plentiful, baked onto a nice chunk of brie cheese. However, here is where the seasoning issue comes in: the crab didn’t taste like anything. It wasn’t bad, just totally flavorless. A little salt, pepper, or perhaps some Old Bay seasoning would have gone a long way to at least bring out something to our taste-buds. It was probably frozen, which sapped the flavor from it. This was a damn shame, because the size of the portion would have been a home run if fresh and seasoned properly. It just missed the mark. The garlic bread points given on the side also happened to be burned (as you can see at the top of this page). I didn’t mind that so much, but I’m sure others would definitely have a problem being served burned bread. The crispness and char worked well with the creaminess of the brie, in my opinion. The crab was a double whammy for my friend, who happened to order the crab cake sandwich as his meal. Same deal. A nice sized ball of crab with absolutely no flavor. The cocktail sauce on the side also did not taste like cocktail sauce. I tried it myself. It was ketchup with something in it, although I have no idea what. My sandwich, thankfully, was excellent. I had the grilled chicken, bacon, and grain mustard sauce on a pretzel roll. The chicken was grilled well, topped with four strips of bacon, and the sauce was delicious. For $12.95 and an additional $2 for fries, I cannot complain. 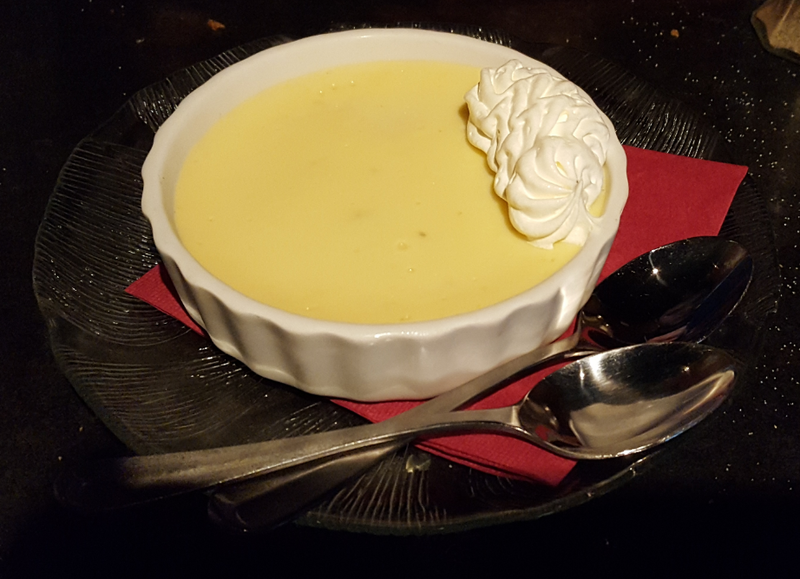 We ended the meal with a taste of their individually baked key-lime pie. He loved it, while I thought it was just okay. As for the service, our waitress was in training. I do not remember her name, but she did a fine job. She was attentive and pleasant. I am sure she will make a great employee once her training is up. Okay, so the final verdict was a bit of a see-saw for me. I wanted so badly to give it a 4, but had to go down a notch to 3.5 out of 5 stars, with the stipulation that I want to return (we both do, even though his dish was a flop) and give it another try with the chance of upgrading the amount of stars. Fireside is a nice place to hang out and they are so close to being something truly special. But until they figure it out and make a few adjustments, you just have to know what to order and hope you don’t land a dud. This review was previously posted here. Fireside Tavern is located at 1500 Historic Drive in Strasburg, Pennsylvania.